When It’s Over… Who Keeps the Ring? 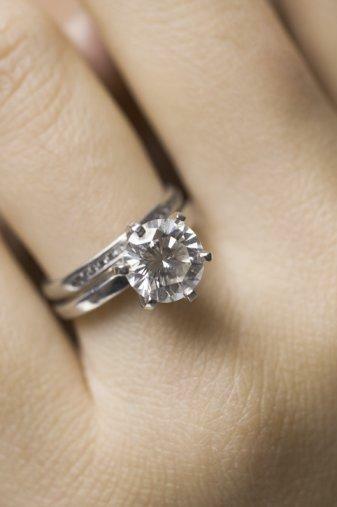 When an engagement ends after twelve days, who should keep the ring? You'd think the answer would be pretty cut-and-dry in that short amount of time: the girl should return the ring and everyone goes on their merry way. Not so in the case of Roger Adler and Rena Hope Friedman. 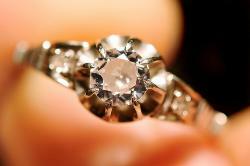 She insisted on keeping the 4-carat diamond engagement ring valued at $58,000. 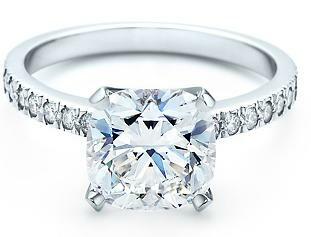 On the day after she received the ring from Roger, she reportedly had it appraised and convinced the appraiser to put her down as the ring's owner, making it easier for her to resell it. Roger broke off the engagement when, after asking that he buy a new BMW and first class tickets to Australia for their honeymoon, she refused to allow his elderly parents to attend the wedding. Roger, for his part, is now suing her, claiming she has a history of persuading men to marry her, and then breaking off the engagement and keeping the ring. Now there's a line of work I never thought to pursue. To read the story in full go to the Herald Sun. There's something about a gold pocket watch – timeless (no pun intended) with a whiff of nostalgia. Perhaps that's why a lost pocket watch always makes for such a sad story. This lost watch story has a happy ending. A teenaged grocery store employee, Piero Ramos, spotted a gold watch in the trash behind the store. He traced the owner of the watch from the inscription on the back, and returned it to its rightful owner, Bill Iwanicki. The pocket watch, it turned out, belonged to Bill's grandfather. It was given to him by Henry Ford when he retired from Ford Motor Company. The watch had been stolen from their home 51 years earlier. 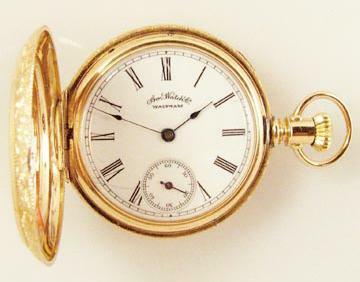 Henry Ford had good taste; a gold pocketwatch is a great gift. You can find beautiful antique versions at my favorite used watch store here. Inscribe them with your loved one's name. As long as his name isn't John Smith, it will be easily identified as his for decades to come! Photo above is from wannabuyawatch.com. 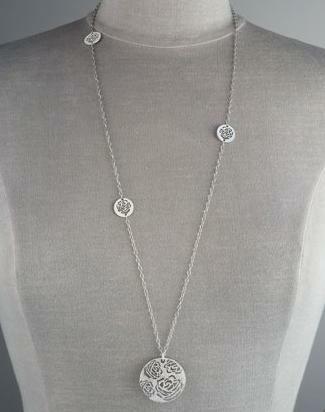 I love fab pieces as someone who focuses on accessories, necklaces always make me pause! Late last year, I had the chance to meet the designer/owner of Fenton and Fallon who creates mixed media pieces that combine ultra femme with a fabulous edge to it! Being able to go through the shop that is near one of my favorite restaurants in the Lower East Side was definitely a way to step into the mindset of a designer who understands the importance of a progressive style that still pays homage to styles that have been popular in the past. 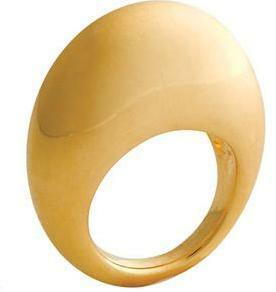 Chunky pieces with glitz and glamor are a staple within this designer's mind. Fast forward to today when one of my favorite designers has a fabulous collaboration with J Crew! I love the pseduo nautical feel that is very present in J Crew's look while also bringing in those elements that are structural components to the concept of Fenton Fallon! This is perfect to take with you to brunch, the Hamptons and so much more. 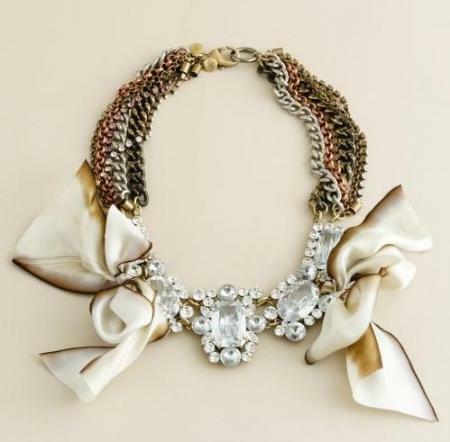 I love the metal chain as well as the bow which combines the sweet and the edge. 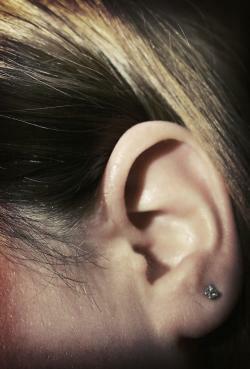 If you're looking for a must see piece, this is definitely one that you should check out! When I was in high school, I lived in Japan for six months. I was in a small town and didn't have a lot of English speaking friends. There was a lot of quiet – time to appreciate the beautiful mountains and rice paddies, the architecture, and the fine arts in the village: beautiful papers and fabrics. I brought home a kimono and it hung on my wall for many years. I'll never forget the richness of the color before the sun eventually faded it. So recently I was delighted to catch this article in the Weekender about Squishy Sushi's recycled jewelry. With lots of gorgeous Japanese prints, the pieces take me back to my time in Japan, and to all the beautiful things made there. Made of recycled materials, Squishy Sushi's concept is to use reclaimed images as art. I love this idea, but rarely have I seen it so effectively put into practice. 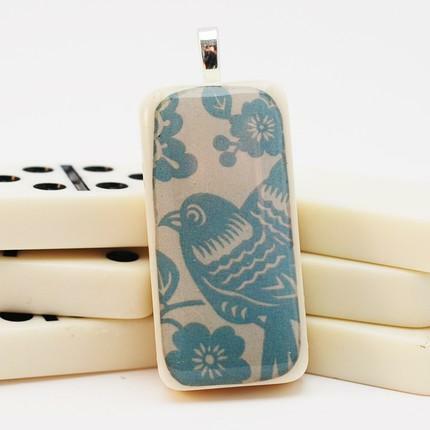 The recycled scrabble tile cufflinks are terrific, but the vintage domino pendants take the cake. 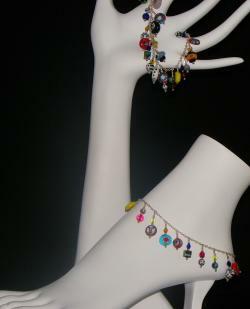 Everything can be found on their website, and the pieces can be purchased through Etsy.com. The prices are reasonable. It's like traveling to another country – without the expense! Photo above is from SquishySushi.